Sgt. David Fawson rescued a baby deer from a wildfire in Northern California. A highway patrol officer who became an internet sensation after he helped rescue a month-old fawn from a Northern California wildfire said Monday he didn't expect the photos to go viral. On Saturday morning, California Highway Patrol Sgt. David Fawson of San Francisco helped Cal Fire officers rescue a fawn from a fast-growing wildfire in Redding, about 230 miles (370 kilometers) north of San Francisco. "We were driving through an active fire, when Cal Fire said, 'Can you take a deer out here for us?'" he said. "I held it in my lap as we drove out." He and his partner took the fawn to safer area miles away, but the baby deer didn't run away like Fawson thought it would. Ever wonder how cats get rescued when stuck in tight spots? Who responds when a mountain lion is seen in a crawl space under a house? Or when a monitor lizard is on the roof of a house? 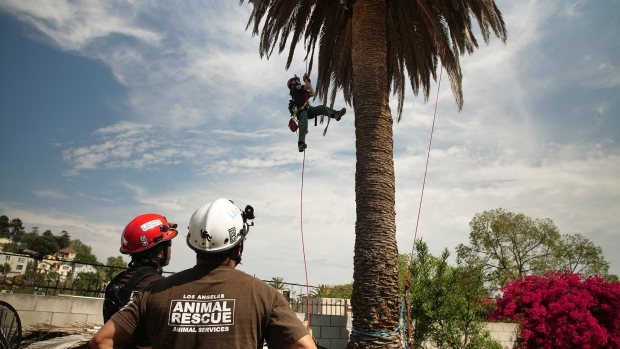 Ride along with the Los Angeles Animal Rescue SMART Team, a group of highly trained individuals who specialize in rescuing animals from tough situations. "It stayed right by me," he said. "When it tried to nurse on one of my fingers, I thought, 'This is truly a young baby.'" Fawson, 38, said he asked a colleague to take a photo because he knew his four daughters, ages 7, 9, 12 and 15, "would love it." The popularity of the photos online took him by surprise. Pictures of the fawn sitting in his lap in a patrol car and licking his neck have been shared more than 16,000 times on Facebook. Representatives from Haven Wild Care's fawn rescue program came to retrieve her within two hours. They named her Carra, after the fire she escaped. Fawson was on a two-day deployment in Redding to help the agency fight the Carr Fire. More than 50 officers from the CHP Golden Gate Division are helping during the wildfire that has destroyed more than 700 homes and claimed six lives in Redding. The San Francisco Chronicle reports that the Haven Humane Society in Anderson has taken in 500 dogs, cats, birds, reptiles and livestock during the fires. The Animal Rescue Foundation in Walnut Creek has also taken in dozens of pets displaced by the Carr Fire in Redding, NBC Bay Area reported. Fawson said thousands of first responders are working to save human lives, structures, and animals. Helping the fawn was a small victory. "Any one of us would have done that," he said. 2016 NBCUniversal Media, LLC. All rights reserved.